[Updated] Minister of Home Affairs Walter Roban is holding a press conference this morning [April 8] regarding a “new energy initiative.” We will have additional coverage later on and in the meantime the live video is below. The Minister announced that starting on May 1st, and running as long as supplies last, people will be able to bring one incandescent bulb to participating retailers and exchange it for one LED bulb, free of charge. He noted that using a 60-Watt incandescent bulb for five hours each day equates to spending $46 each year to run that light, and switching to an LED equivalent to that 60-Watt incandescent will cost about $6.90 each year. Update: The live broadcast has concluded and the 13-minute replay is below, we had a ‘tech issue’ and missed the start, sorry! Update 1.25pm: Minister Roban said, “I am pleased to announce the details of the Department of Energy’s LED exchange initiative. 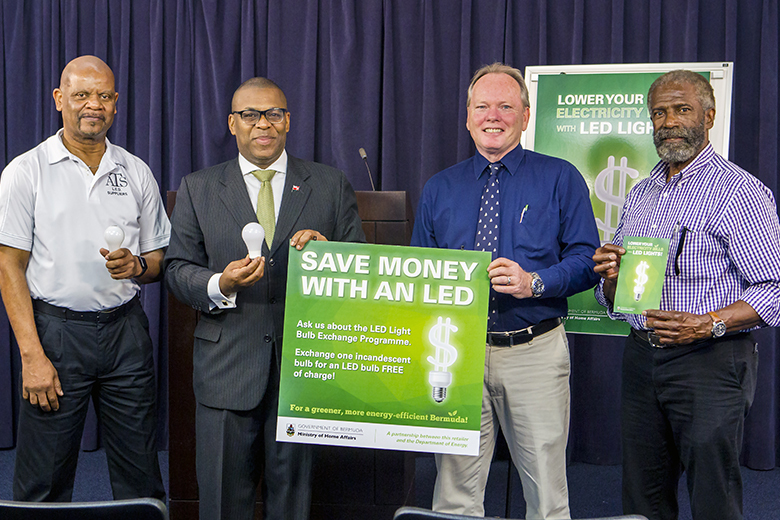 “Starting on May 1 and running as long as supplies last, members of the public will be able to bring one incandescent bulb to participating retailers and exchange it for one efficient, clean and cool LED bulb, free of charge. Government has committed sufficient resources to allow about 30% of all households to take up this initiative. “By working with the local retailers we found that the LED equivalent to a standard, 60-Watt A19 bulb – what most of us use – is the most popular choice for customers. An LED equivalent uses only about nine watts, as opposed to 60 watts for a ‘regular’ incandescent bulb. “What that means in dollars and cents is that using a 60-Watt incandescent bulb for, say, five hours each day equates to spending $46 each year to run that light. Switching to an LED equivalent to that 60-Watt incandescent will cost about $6.90 each year. This all adds up at 85% less energy being used. “At an average cost of about six dollars each, a single LED would pay for itself within just a few months, and, after that, the savings would begin to accumulate. LEDs also have a longer life span than incandescent bulbs, lasting about 50,000 to 100,000 hours as compared to incandescents, at only about 1,200 hours. “Though an incandescent bulb may seem like the better choice when comparing the first cost, it actually winds up costing customers more to use and more to replace. We need to rethink how we spend our hard-earned money, taking into account operating and life cycle costs. “Some argue that LEDs just do not “look as good as incandescents”, or that they are not the same size or style. This is no longer the case. LED technology has improved greatly over the past few years, where there is now a staggering variety of shapes and colours available. “This LED initiative will allow customers to try them out, at no risk. What we are proposing in our initiative is a like-for-like swap, so the public can have a taste of what they might use for their other fixtures. “The Department of Energy has worked diligently with retailers on this initiative, to show the public that energy efficiency doesn’t have to be an inconvenience. We don’t have to sit around in the dark just to cut our bills! Energy efficiency is good for everyone, and we want to invest in the process for Bermudians to show that it is accessible, affordable, and equitable. “All participating retailers will have a poster on display in their store, indicating to customers that they are a participating vendor. Supplies will be limited and the limit is one bulb per customer, but bringing in your old bulb is a must; as another goal of the initiative is to eliminate the old and inefficient technology. “Accompanying that new bulb will be a leaflet with information about LEDs so that customers can learn more about the choices available, how to select the right LED for their needs, and the benefits of using LED bulbs. “We hope that the public will take advantage of this opportunity to see and experience how easy energy efficiency can be. “Historically, energy efficiency and energy conservation is not something that we have been focused on as a country. Some of our high energy use can be attributed to our high standard of living. Most homes have some air conditioning, and almost all have other modern conveniences, like refrigeration, laundry machines and dishwashers. “Bermudians also have the highest penetration of internet connectivity in the world at 98%, while the rest of the Caribbean is only half of that. Regionally, our use of electricity is second only to that of Cayman, mainly because they have a year-round need for air conditioning. “In short, we all feel the pinch when we see our monthly electric bills. He said that in June 2018. Why does’t Bermuda just learn from other jurisdictions. It is a great move, but come on Bermuda Government this happened about 5 years ago in most jurisdictions. This will certainly further reduce demand for power generation and help save our planet. With less generation capacity needed, profits at Belco should also drop. Yawnnnn…What is your degree in again? Will they also replace the bulbs that are on dimmer switches? If only we could harness the energy from all the hot air coming off the Pee-el-Pee we’d be set. Meh, the PLP are pretty much useless and pretty much everything but it’s hard to get upset by this. Free? Someone is paying and if it is Government then the tax payer is paying. Nothing is free so who is paying? Yep. It’s roban giving us back the LED lights that we paid for in the first place. And of course he wants a pat on the back for doing it. If they spent less time doing useless stunts like this maybe we wouldn’t be on the blacklist. Well SpongeBob told us de airport is FREE!!!!!!!!!!!!!!!! That is true, so best thing the public can do is get the free lightbulb so they’re coming out of it with something. What you want? A cookie? Most expensive things in life are free.